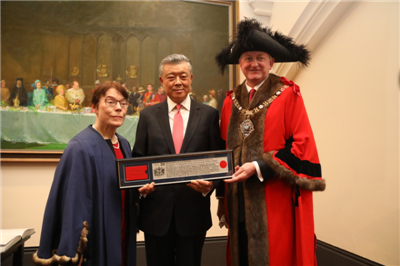 On December 3, the City of London Corporation bestowed upon Ambassador Liu Xiaoming the Freedom of the City. 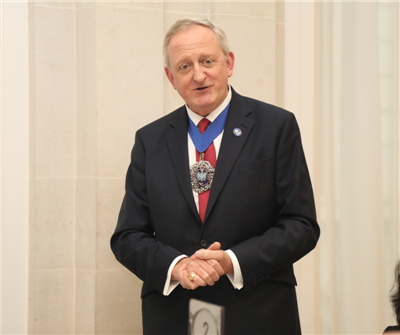 Peter Estlin, the Lord Mayor of the City of London, presided over the ceremony, presented the certificate to the Ambassador, and hosted a celebration luncheon. Madam Hu Pinghua, wife of Ambassador Liu Xiaoming, the Rt Hon. Mark Field MP, FCO Minister of State, Alistair Harrison CMG CVO, HM Marshal of the Diplomatic Corps, Sir Douglas Flint CBE, the UK Treasury's Belt and Road envoy, Catherine McGuinness, Chair of Policy and Resouces Committee of the City of London, Geng Jinhai, Chairman of China Chamber of Commerce in the UK, and representatives from Chinese and British governments, business and media were present. Witnessed by Mcguinness (left), the Lord Mayor (right) presents the certificate of the Freedom of the City to Ambassador Liu,. 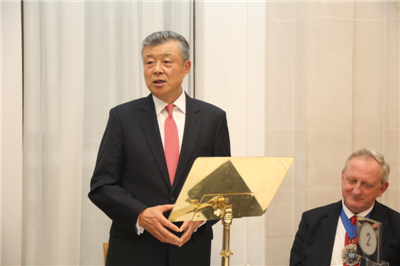 Ambassador Liu noted in his speech that being a City Freeman is not only an honour for himself but also a recognition of the work of the Chinese Embassy. 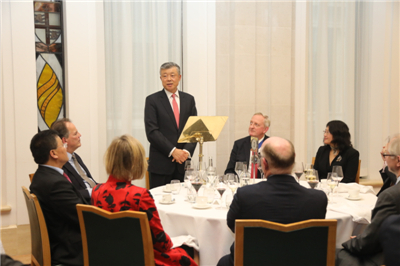 This demonstrates the importance that the City of London Corporation attaches to China-UK financial cooperation, and embodies the friendship between the people of the two countries. Such cooperation has contributed to three important records, namely the greatest number of "first's", the most productive cooperation and the most extensive and far-reaching significance in China-UK relations. Looking ahead, China-UK financial cooperation enjoys enormous potential and broad prospects. The Ambassador pointed out that China's deeper reform and further opening up, China-UK cooperation on the Belt and Road Initiative (BRI) and the sound China-UK relationship will inject a strong impetus into China-UK cooperation in various fields, and create more business opportunities for the two countries to expand financial cooperation at a higher level and in a wider scope. He expressed the hope that China and the UK will view their relationship from a global and strategic perspective, respect each other's core interests and major concerns, and work together to ensure that the "Golden Era" remains "golden" and to create an even brighter future for China-UK relations. 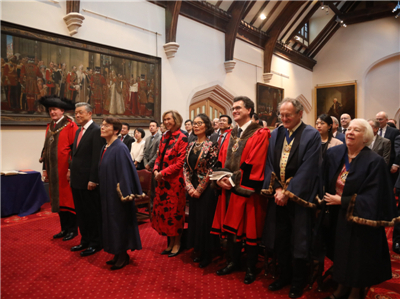 The Lord Mayor in his speech spoke highly of Ambassador Liu's significant contribution to promoting China-UK financial cooperation and enhancing China-UK relations over the years. He said that it was during Ambassador Liu's term that Chinese President Xi Jinping paid a successful state visit to the UK and opened the "Golden Era" of China-UK relations, laying an important foundation for the development of relations between China and Britain in the 21st century. The Freedom of the City of London is the highest honour awarded by the City of London Corporation in recognition of those who have made outstanding contribution in relevant fields. Queen Elizabeth II, former British Prime Minister Churchill, former South African President Nelson Mandela, and then Beijing Mayor Wang Qishan have all been awarded this title.